Verdict: Good selection of Minangkabau food in a cosy café ambiance. It was our first time at Pinang Masak Cafe and we didn’t know what to expect. I hardly venture into Bukit Tunku, unless it’s for drinks at a popular English pub a few doors away from Pinang Masak Café. 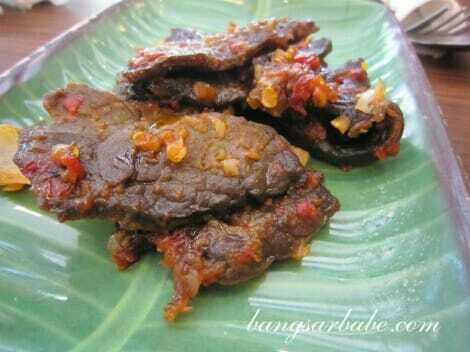 That Saturday afternoon, rif suggested a Minangkabau/Padang lunch to break away from our usual chap fan pattern. The décor was Spartan, but the place was cosy with old newspaper cuttings adorning the walls. We were greeted by a friendly old chap, who gave us attentive and unobtrusive service throughout our lunch. 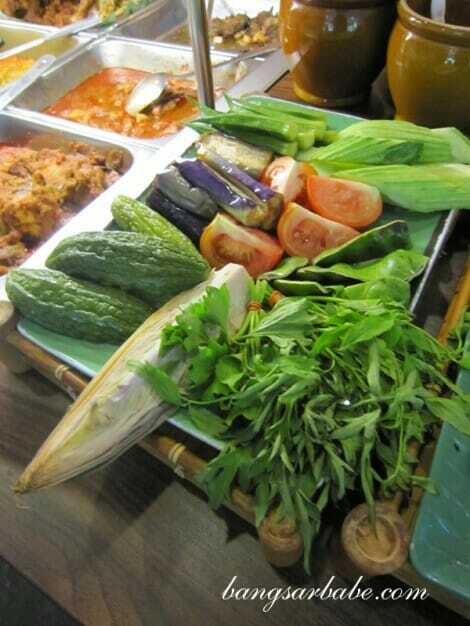 The menu comprises specialty dishes such as lontong, laksa Johor, mee kari, mee rebus and nasi kerabu. Pinang Masak also serves a variety of Minangkabau dishes like ayam rendang, ayam masak merah, sambal sotong, sayur lodeh, tempe goreng, pucuk paku, udang masak lemak, ikan asam pedas and ulam. I opted for the ayam rendang (RM5.50), sotong masak hitam (RM6.50) and tempe goreng sambal (RM2.50) to go with my white rice. The rendang gravy was thick and redolent from the assortment of spices and chillies. I enjoyed the chicken – tender, smooth and juicy – as it was well-flavoured by the rendang gravy. 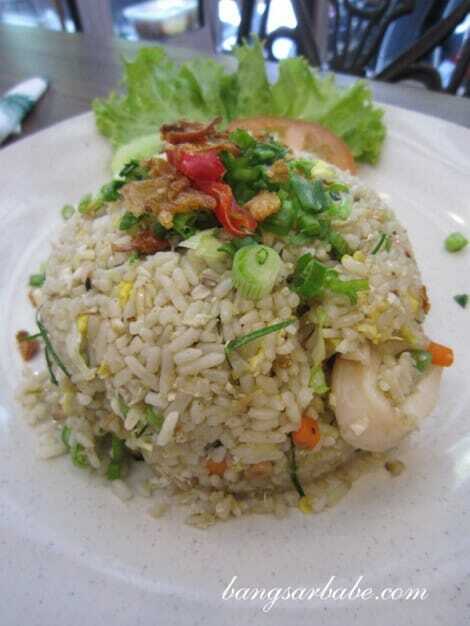 It worked as a flavourful accent to the rice (RM2). Also quite tasty was the sotong (squid). 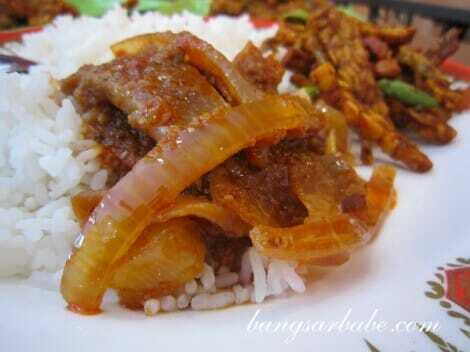 The masak hitam gravy was spicy and sweetish in flavour, and the squid was cooked to a tender state. That said, I preferred the gravy to be thicker. 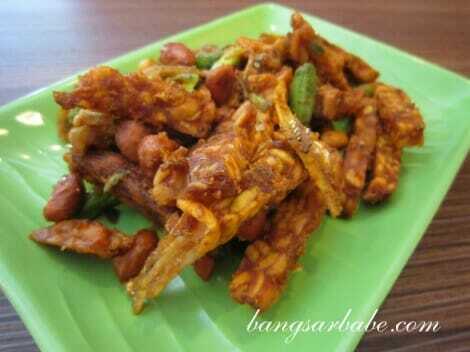 The tempe was deep fried until crispy and cooked with sambal, ong beans, ikan bilis and petai. I didn’t care much for this as I like my tempe nice and moist at the centre; this was crispy all over. The highlight of our lunch was definitely the lontong special. The lontong special comes with an option of ayam rendang, sambal sotong or paru (beef lung) as a side — we opted for the paru. I loved this. My bowl of lontong comprised chunky rice cubes (nasi impit) and sayur lodeh, with long beans, cabbage, glass noodles, tempe, tofu cubes and egg. All the ingredients were further bound together with a topping of peanut sauce and sambal chilli. This was mildly spicy, imbued with a considerable richness from the coconut milk and full of varying texture from the ingredients. Good stuff! The paru was adequately prepared, resulting in tender lung slivers in a spicy sambal chilli dressing. I actually thought the nasi goreng kerabu (RM11.90) was going to be blue in colour. But it came looking like the above. I reckon it looked more like nasi goreng ulam. Light in colour but not in flavour, the rice came with bits of bunga kantan, daun kunyit, daun kesom, chicken, prawns and a few other ingredients I can’t make of. The rice was rightly moist, firm, yet fluffy and aromatic from the herbs. rif seemed to enjoy this more than I did – he polished most of the rice. We were too full to contemplate dessert, so we’re leaving that for our next visit soon. 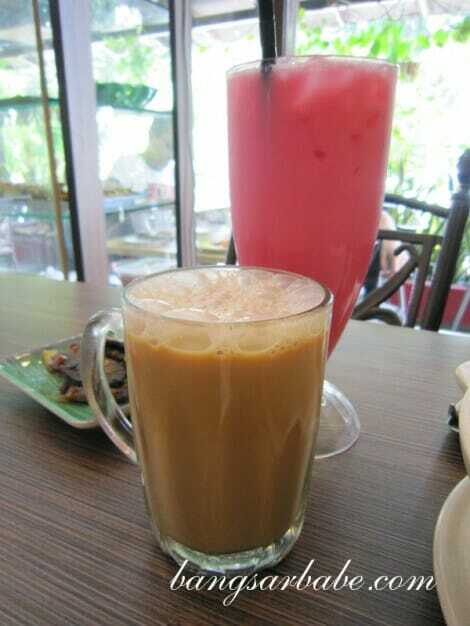 Prices aren’t cheap (my teh tarik and his sirap bandung cost RM4 each! 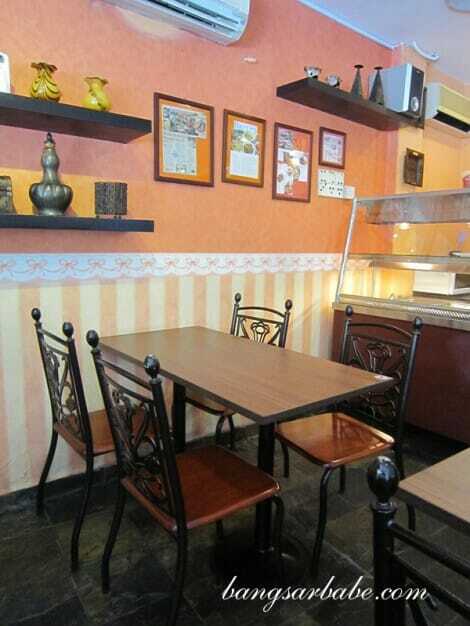 ), but the food is relatively good and the dining ambiance is ideal for comfortable meals. I’m already planning to try their laksa Johor and mee rebus next! 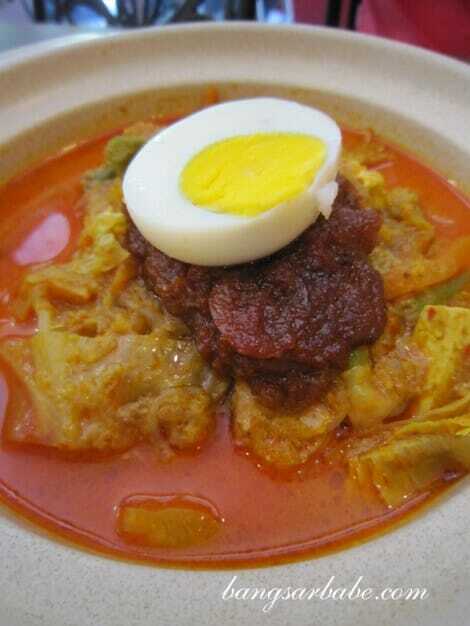 i remember coming here once, never can understand why i didnt go back since but i certainly do remember the lontong and thats one thing i cant get in australia! Go there for lunch on Saturday…and have drinks at Sid’s! Hehehehehe…. i can’t wait to eat these delights when i go back to kl. really cannot wait. i was actually disappointed with my nasi kerabu. i expected it to be tangy but it wasn’t, tasted like normal fried rice to me. Nasi impit! 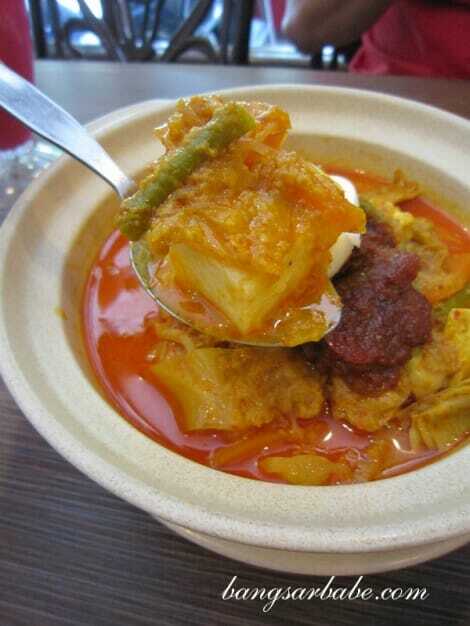 I haven’t had that for a while, last time I had it was in Johor…where I also had lontong incidentally. A lot has changed with Pinang Masak since the comments above actually. They open til late most days now. The best part about it is, I’m having my lontong delivered to my doorstep! Of course, I’m only a few doors away from them. Just niiiiiice!